In a perfect world, we would have a single blockchain and a single cryptocurrency. But that doesn’t seem to be in the cards, whether it is technically feasible or not. Although wide-scale adoption and a critical mass of users aren’t there yet, the market is signaling for a diversification of choices, some based on the bitcoin currency and its blockchain protocol, and others not. Bitcoin currency + bitcoin blockchain: Bitcoin. Yes, that’s the only one there, as it’s the reference point. Bitcoin currency + non-bitcoin blockchain: Blockstream, Truthcoin. Side chains are used, and they are “pegged” the main bitcoin blockchain via various schemes. Non-bitcoin currency + bitcoin blockchain: Factom, Mastercoin, Counterparty, Namecoin. In this case, the bitcoin blockchain is used, but a native currency fuels the operations of that other platform. 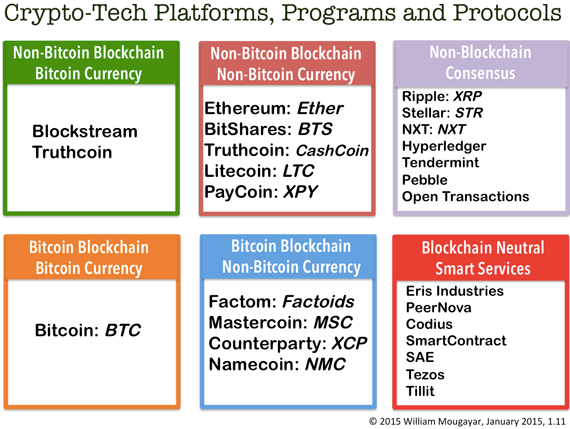 Non-blockchain consensus: Ripple, Stellar, NXT, Hyperledger, Tendermint, Pebble, Open Transactions. These platforms implement decentralized consensus and decentralized trust without a blockchain construct as its nucleus. Blockchain-neutral smart services: Eris Industries, PeerNova, Codius, SmartContract, SAE, Tezos, Tillit. This category will probably need to be divided further, as it is still developing, but it includes a mix of decentralized platforms and interesting smart contract services. The lines between protocol and platform are sometimes distinct (e.g. Namecoin, as a protocol), and sometimes they are not (e.g. Ethereum, as a platform and protocol). Smart programs are arguably the next category of “apps” to live on the blockchain, aside from the multitude of cryptocurrency wallets and payments services that have dominated so far. The following segmentation matrix shows what we see today, but there is no guarantee that the landscape will stay the same in the near future. Many players have a vision, but still don’t have users, let alone working beta versions or even testbeds. I don’t remember a time when white papers generated so much interest and excitement, way before products arrived. In search of the “perfect” solution? Bitcoin is still the big kahuna, and it is interesting that its platform is both competing and cooperating with others. Bitcoin does have a market advantage, despite some of its shortcomings. Bitcoin still holds the majority of the mining and market value power when you look at the landscape from a cryptocurrency market capitalization point of view; we can’t ignore bitcoin’s existing infrastructure and critical mass of miners and users that have made its network defensible and relatively secure so far. And it’s too early to predict the impact that a diversification of blockchains will have on bitcoin’s own mining, and how alternative solutions will support their own platforms to minimum acceptable levels for secure and trustworthy operations. But you can’t ignore the astounding amount of innovation that is taking place “around” bitcoin proper, either. There is no doubt that some of the projects listed may not succeed in the long term, but they are all contributing to advancing the state of research and practice into the emerging cryptocurrency computer science space. For example, the SCIPR Lab is doing ground-breaking research in the area of cryptographic proof systems, with a goal to provide succinct integrity and privacy. Their work is to be lauded because “proof processes” are at the heart of the blockchain’s operations, and the advancement they will achieve will eventually benefit the whole market. Of course there will be competition in this landscape. However, before we get to real competition, many of the players are still working on basic foundational aspects, such as speed, costs, scalability, privacy, and security of their blockchain services. These are table stakes in traditional software development, but they are not to be taken for granted (yet) in the blockchain/decentralized world. Decentralized consensus, decentralized trust, and distributed proof systems are some of the areas that are part of the next frontiers in software development. Reality is, the blockchain is not a very efficient construct on its own, so we need to envelop it with a lot of peripheral innovation in order to make it viable. But the blockchain has a big dream, and it is making developers, researchers, scientists and visionaries very thirsty for solutions. Just when you thought you understood the concept of the blockchain and its role, now you need to take a deeper dive and evaluate the various choices. Beneath the joys and excitement of the blockchain’s promise lies the pains and agony of its implementation. Image on article and category pages by BTC Keychain on Flickr, used under a Creative Commons license. We’ll be delving into more bitcoin and blockchain technology topics at our upcoming Bitcoin & the Blockchain Radar Summit January 27, 2015, in San Francisco. Visit our event website for more on the program and for registration information.